Please refer to our stock # 1984 when inquiring. 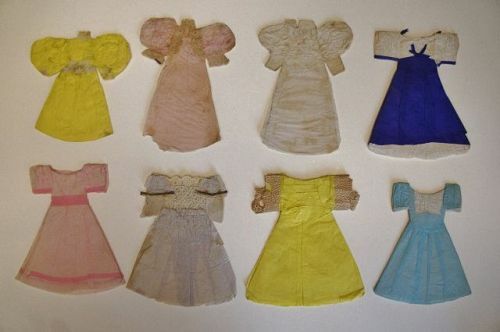 This is a collection of paper doll dresses from the 1840-50's. They are all cut from tissue paper and glued to blue lined school book paper of that era. The lace looks and feels like Dresden pressed paper. Some of the dresses have backs, fronts and then open to allow to drop over the paper doll's head, like a billboard A frame. Some have names like Flora, written on the inside. One reads Sunday, another Eliza and one that says Dora. They are in surprisingly good condition with just one showing some loss at the hem line and there is some age discoloration on all of them. There are 8 of them and they range is size from 4" to 4 1/2".. All done by the same hand. They would make wonderful photographs for cards. They are circa 1840-1850.